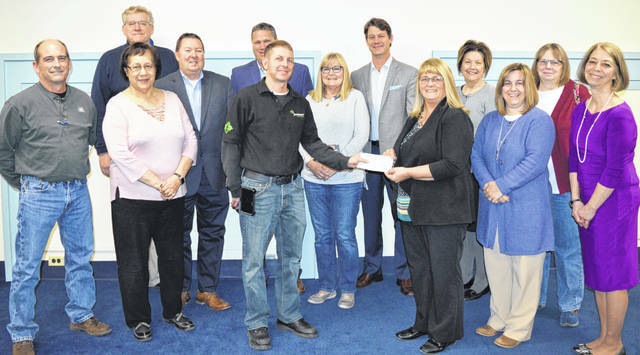 A “ceremonial check” was presented this week from the Board of Clinton County Commissioners to the Clinton County Foundation to start the Clinton County Legacy Fund. The legacy fund will have a start-up amount of $10 million to invest and generate ongoing income for grants that benefit the community and its residents. The $10 million start-up principal is part of the proceeds the county received from selling county-owned Clinton Memorial Hospital. The steward for the legacy fund is the not-for-profit Clinton County Foundation (CCF). In the front row from left are CCF board members Neal Bond, Eleanor Harris, Jeffrey Hoak (receiving the check), Clinton County Commissioners President Brenda Woods, CCF board member Chaley Peelle Griffith and CCF Executive Director Jan Blohm; and in the back row from left are CCF board members Sam Stratman, Scott Holmer, Commissioner Mike McCarty, CCF board member Joyce Kelly, Commissioner Kerry Steed, and CCF board members Janet Dixon and Pat King.